I know, my English is not the best, it´s not my first language and I write/ speak sometimes also very funny. If you see in Oman strange sign, no matter on the street or in the newspaper you realize it immediately and start laughing. I read Time of Oman quite regularly, particularly Monday’s and Wednesday’s issues. I’m looking for a job, my background is Tourism and Accounting. In today’s job section I have found very interesting ad- looking for an Accountant. There’s only one condition-he/she must be simple. 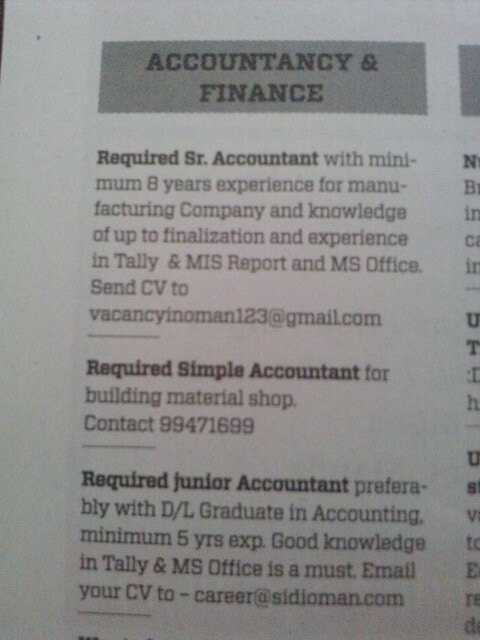 By the way, anybody looking for Accountant or Business related clerk?i’m still looking for my dream job here in Oman. This entry was posted in Uncategorized and tagged funny ads, times of oman. Bookmark the permalink. And your written English is charming. What’s your first language? Hahaha! I love these funny English ads!